Businesses along the Washington Road and Beverly Road corridors are being encouraged to apply for facade improvement grants currently available and co-sponsored by the municipality and the Pennsylvania Department of Community and Economic Development. In brief, the program is a 1/3 match up to $5,000 so that for every two dollars spent on improvements by the business owner, a dollar of grant money is obtained. Eligible facade improvements include new signs, awnings, lighting, painting, a reconfiguration of entrances and door or window replacement/repair. 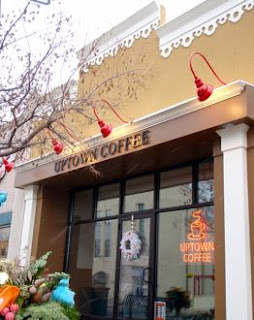 Taking wonderful advantage of the program is Elizabeth Boyd, owner of Uptown Coffee on Washington Road. Her cafe is benefitting from a totally-revamped entryway with new exterior lighting, painting and trim. The added space at the front of the cafe allows for sink-into-me chairs you may never want to leave. The grant sunsets on June 30, 2011. Interested parties should contact Eric Milliron at emilliron at mtlebanon.org to determine eligibility, process and cost issues. Eric would love to see more participation! The Emmaus Community Needs Your Help! Happy Holidays From Mt. Lebanon Magazine!